It's time for Page 2's Referee Rankings! Sports officials are almost never appreciated. Never mind that they are highly trained professionals who perform difficult jobs with an amazing level of skill and expertise. We as fans don't notice the 100 calls they get right. Nope. We notice the one they got wrong. Then we discuss it ad nauseam at the water cooler and post vulgar comments to Internet message boards. No more. It's time the zebras got a little respect, and Page 2 is happy to oblige. 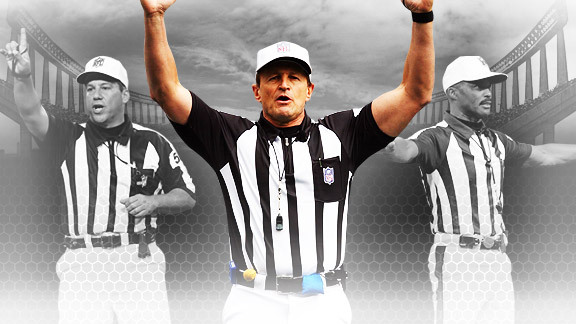 Thanks in part to his muscular physique, Hochuli is the most recognizable official in NFL history. He played linebacker at UTEP and maintains a rigorous workout regimen. He's a partner in a Phoenix law firm and shares inside jokes with Brett Favre. Although Carey graduated from Santa Clara in 1971, he appears to be about 30 years old. He became the first black crew chief to work the Super Bowl in 2008, and he co-owns a snow sports gear company. 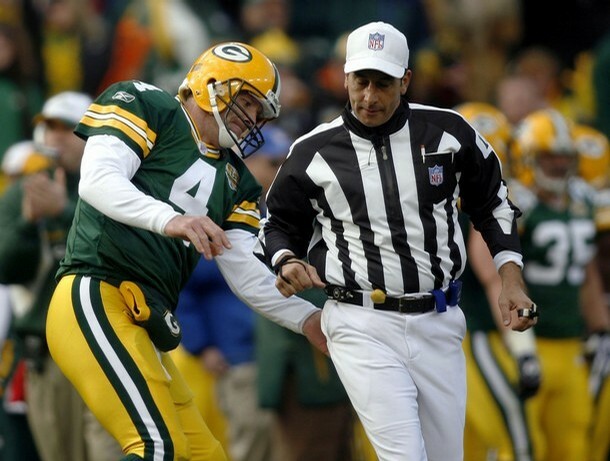 Carey's older brother Don is also an NFL official. Riveron immigrated to the U.S. at age 5 from Cuba and went on to become the first Hispanic referee in NFL history. It's the American dream. Work diligently and follow your goals, and you too can be booed in front of tens of thousands of angry, inebriated fans. Steratore is the ref who correctly overturned a potential game-winning TD catch by Detroit's Calvin Johnson in Week 1 of 2010. He's also the poster boy for error links on all NFL team websites and might know Favre even more intimately than Hochuli does. Triplette is a Gulf War veteran who has worked as an NFL official since 1996. His crew ranked second behind Hochuli's in penalties per game last season. He also tends to hit players with flags and get knocked down by players with some regularity. Boger played quarterback at Morehouse College and became the third black referee in NFL history in 2006, after Johnny Grier and Carey. He wears No. 23, which was once worn by Grier. In 2009, he shared an awkward, misunderstood high-five with Vince Young. Tunney, known as the dean of NFL referees, grabs our alumni spot for a distinguished 31-year career. He's the only ref to work consecutive Super Bowls, and he even officiated in World Team Tennis. He also sells his own bobblehead at jimtunney.com. Cheffers is perhaps known best for this forgettable moment in Houston in 2010. His crew called the most penalties for roughing the passer (10, tied with Riveron) in 2010 after calling among the fewest in the previous two seasons. Did someone get a memo? In addition to being an NFL referee who has worked two Super Bowls, McAulay moonlights as Big East coordinator of football officiating. (Don't quit your day job.) He made the No. 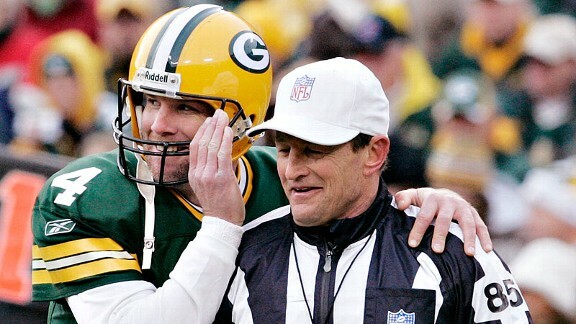 9 most controversial call in NFL history as rated by NFL Network. Green is known for disallowing a touchdown by Pittsburgh's Troy Polamalu in 2008, which resulted in the only 11-10 final score in NFL history. The Steelers beat the Chargers anyway, but if you're wondering, the Steelers were favored by 4½ points. Hmmm. Neumann: It's Page 2's Long Snapper Rankings! Neumann: Who tops Page 2's Punter Rankings? Detroit rocks in Page 2's Backup QB Rankings! Neumann: Who's the NFL's top backup QB?